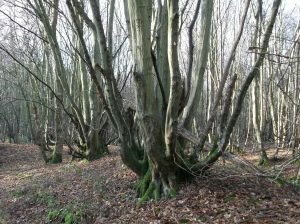 Many of the woods for thirty miles around, and even within, London( for example, Highgate woods, Queenswood, Coldfall Wood - all in Harringay) are predominantly of hornbeam coppice. These were usually planted with maiden (single-stemmed) oaks, which were timber trees. Hornbeam is a native tree, a little like beech in appearance, but with bark that looks as if it has been flayed. Although it naturally forms a single stemmed tree, hornbeam also coppices easily. These were once worked woods, cut in cycles to supply wood, which is very dense (hence horn-beam). Hornbeam was used as a crop for fuel (either directly or as charcoal) as it was so slow burning. As it was so hard that it did not distort, it was also for moving parts such as the hubs for wagon wheels. It is said that some of these woodlands date back to Roman times and beyond, where the charcoal was needed for smelting iron. The coppicing meant the tree trunk was cut across close to the ground so that it would quickly generate a large number of shoots –maybe twenty or thirty. Over the years, the number would be reduced in competition to fewer than ten, which would persist until they themselves were cut as a crop every several years - (coppicing of many trees is on a cycle of seven to ten years). Different sections of the woodland would be cut in rotation to yield a fresh crop every year. Once coal became more readily available (through improved transport systems - canals & rail etc. ), the need for the hornbeam crop fell. Nowadays unless an owner is managing the woods and has started to re-coppice - the coppices are lapsed, and the shoots have become etiolated (tall and thin) in their search for light. Hornbeam is deciduous so the woodland flora associated with them tends to be plants which flower early in the year before the canopy of the hornbeam leaves emerge to form a dense shade. 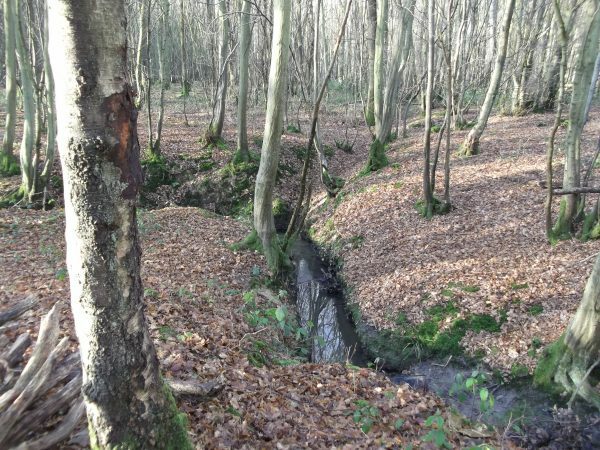 So a hornbeam coppice wood may well have celandines, primroses, violets, wood anemones and eventually bluebells, in succession in the first months of the year. 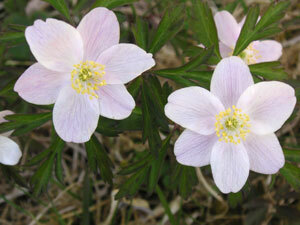 In time, sadly , the shade may become too much for some of these, and the flowering spectacle diminish. Re-coppicing is an option, but in these days of ubiquitous squirrels and deer, the new shoots have to be protected, so it is not a straightforward task. it was customary to create a ditch and bank system, usually with a hedge along the top of the bank, to divide sections of a wood or to create a boundary from the road, particularly if drovers used it and their sheep or cattle might have strayed into the woods. Often the hedge was again hornbeam coppice, but cut infrequently. This hedge / barrier would also have been layered to form an impenetrable barrier . This means that vertical shoots were partially cut through then bent into the horizontal, and woven – usually through a series of posts. This ‘encouraged’ them to soon send up shoots to make a stockproof hedge. Hedgelaying at its best is a real art and each county had its own style. 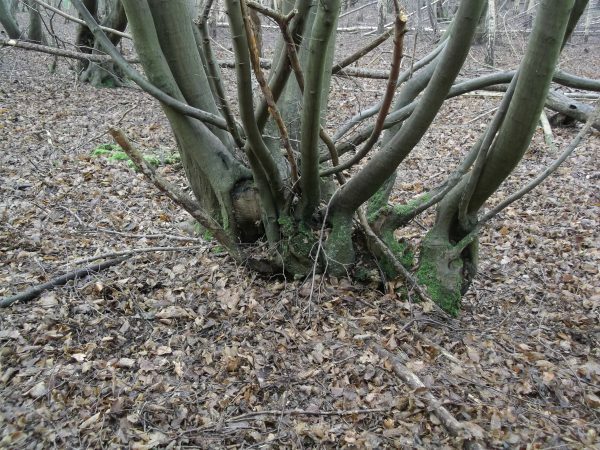 If you are lucky enough to have a wood with the remnants of ditch and bank anywhere, the the coppices on the bank should appear as huge old bases or stools, often with the evidence of the shoots having been forced (in their history) into the horizontal to join the adjacent coppice stool. Anywhere with an ancient parish boundary along it could well display these features. The diameter of the coppice stool is thought to be good evidence of the age of the tree itself (obviously the shoots are much younger, so tree ring counting won’t help), and certainly some of the giants that are five to six feet across must date back hundreds of years. For anyone in north London, Coldfall Wood in East Finchley shows most of the features described - a range of ages of hornbeam coppice (as it has been recently re-coppiced ), an Anglo-Saxon ditch and bank which divided the wood from the stock on Finchley Common (now allotments and a cemetery in that area), and some fantastic old but still living coppice stools, alongside the ditch. Many of the woods around London would show similar features once you look for them. There are even stretches of hornbeam / oak woodland alongside the North Circular Road. 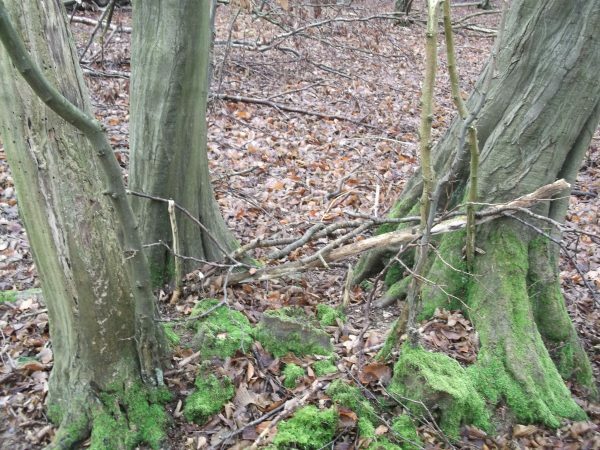 Did people really coppice hornbeam every seven – or even ten – years? I have an ancient hornbeam coppice wood with oak standards (and twenty other native species). My aspiration is to coppice every 35 years, by which time the growth is substantial and worthwhile. After seven years, the coppice is a thicket with very small stems. After ten, you could probably get at it but much effort would produce a lot of brash and little worthwhile firewood.